This weekend Mabel and I went to the community garden to do a little digging. Since I'm the newest volunteer there, I feel best about doing hard labor over planting any of the crops, at least until I get my sea legs there. That doesn't mean I can't enjoy a little of the bounty though! It's still early in the season to harvest any veggies, but the herbs are going bonkers. I brought a couple handfuls of thyme and about a cup of chive blossoms home to make herbal vinegars. "Thyme has a pronounced effect on the respiratory system; in addition to fighting infections, it dries mucous membranes and relaxes spasms of the bronchial passages. 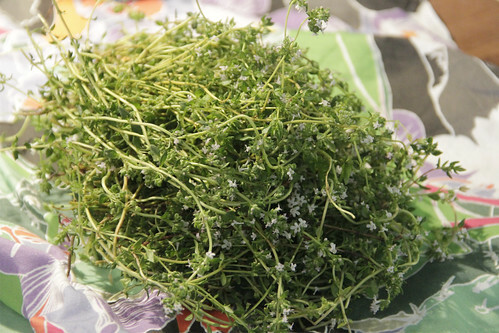 The ability of thyme to relax bronchial spasms makes it effective for coughs, bronchitis, emphysema, and asthma. Its drying effect makes it useful to reduce the abundant watering of the eyes and nose associated with hay fever and other allergies. And gargling with thyme tea can reduce swelling and pus formation in tonsillitis. Thyme combats parasites, such as hookworms and tapeworms, within the digestive tract. It is also useful to treat yeast infections." Chives have less medicinal value, but are high in Vitamins A and C as well as folic acid, sulfur, and iron. If you haven't tried a chive blossom before, they're in the onion family, so they have a mild onion taste, but also a surprisingly pleasant note of garlic. 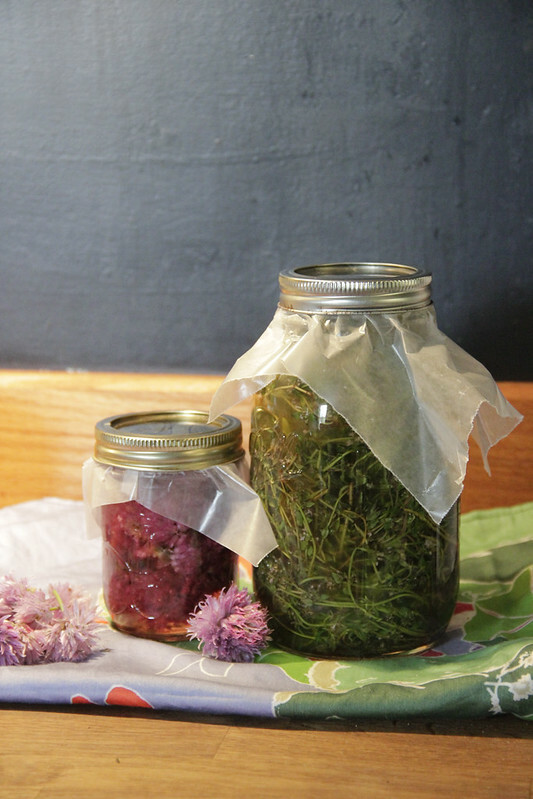 The chive blossom vinegar will be the perfect addition to homemade salad dressings. Thoroughly wash and pat dry the herbs, stuff them into the sterilized jar. With the chive blossoms I warmed white wine vinegar and covered the chives, but with thyme I wanted to reap the enzymatic benefits of apple cider vinegar in conjunction with the thyme so I didn't heat it. Cap the jar with a layer of wax paper to prevent the metal to come in contact with the potentially corrosive vinegar. Steep the herbs for several weeks. Give 'em a good shake or two each day. After at least 2 weeks you can strain the vinegar from the herbs for storage or leave the herbs and just strain off the vinegar as you use it.